Musicians From All Over the Country Have Come To Expect The Very Best Gear Protection From Our Amp Rack Cases. Built To Last a Lifetime, The AR-4 Was Made With Quality High-End Materials And Stands Out With Its Striking Rugged Good Looks. Add To That The Extreme Low Price and You Have a Winner Right Here! What is the AR-4 Famous For? Professional DJ's, Sound Mechanics and Music Bands Live in Fear Constantly. With Tens Of Thousands Of Dollars In Equipment, They Are Petrified Of Travelling And Of The Damages That The Road Inflicts On Their Precious Cargo. 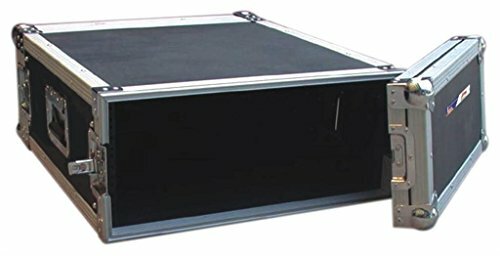 Enter the Audio Dynamics Amp Rack Cases Line. Our Cases Protect, Shield, And Keeps Your Equipment in Top Shape On The Road, On Tour And On Flights. - 4 Space Fully Extruded Equipment Rack 20" Usable Depth. - Front & Back Eia Tapped Steel Rack Rails. - 3/8" Black Polydura Laminated Plywood Construction. - Removable Fully Extruded Front & Back Doors. - 1 Heavy Duty Recessed Spring Loaded Handle Per Side. - Heavy Duty Recessed Riveted Hardware And Clamps. - Loop Lock Recessed Latches With Padlocks Supplied. If you have any questions about this product by Audio Dynamics, contact us by completing and submitting the form below. If you are looking for a specif part number, please include it with your message.